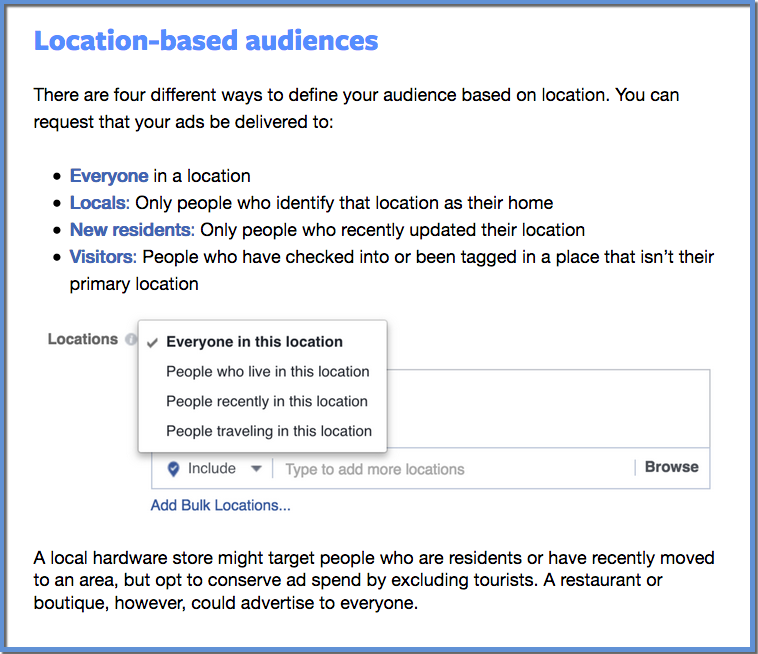 Location targeting on Facebook can be a powerful feature. However, there are challenges to understand exactly how Facebook uses different pieces of available information to determine a user’s location. I’ve written in detail about location targeting before. Yet, as with many topics, there is always room to explore in more detail. Facebook’s “Recently In” target feature is one such area that deserves a bit more attention. Everyone in this location (default): This option allows you to reach people whose home or most recent location is within the selected area. You might want to advertise large fairs or high-profile sporting events, for example, to everyone in a location. People who live in this location: This includes people whose home is within the selected area. You might want to advertise a local retail store, for example, to people who live in a location. People recently in this location: With this option, you are reaching people whose most recent location is within the selected area. You might want to advertise time-sensitive sales, for example, to people recently in the location you choose. People traveling in this location: This includes people traveling in the selected area as determined by the device and connection information that Facebook collects who are more than 125 miles from their home location. You might want to advertise rental cars, for example, to people traveling in a location. The option for “People recently in this location” may seem fairly straightforward. We’re targeting those users who had this as their most recent location – ok, got it. But, there are several questions around this. Specifically…. Recently in this location: People whose most recent location is the selected area, as determined only via mobile device. This includes people who live there or who may be traveling there. People traveling in this location: People whose most recent location is the selected area, as determined via mobile device, and are greater than 100 miles from their stated home location from their Facebook profiles. The original help page where I pulled the device targeting info now redirects to a variety of general ad targeting resources. One of these is Facebook’s Blueprint Training Module on Core Audience Targeting. Huh? This is very confusing. According to the way this is worded, it seems that we should interpret the “People recently in this location” to equate to New Residents. That is, the “People recently in this location” is more about people who have recently arrived to a location, which is seemingly differentiated from “People who Live in this Location” based on recency alone. One potential explanation? This may be simply a mistake in Facebook’s training. Here’s why I think this: The definition above is not reflected anywhere else in Facebook’s documentation on this topic. As described earlier in this article, the main help page dedicated to Location Targeting defines “Recently In” as “People whose most recent location was in the area.” This does not imply anything about newly arrived residents. This seems like a mistake in Blueprint. If you’re reading this, Facebook, we’d love an updated Blueprint training that has more detail on this topic! How Could “Recently In” Work in Reality for Advertisers? I believe we can most easily think through the various targeting options by looking at some scenarios. Scenario 1: A resident is traveling on vacation. Let’s say we have someone (I’ll call her Cassandra) who normally resides in New York City, and is currently traveling in Miami. Which targets would include Cassandra? That said, I can think of one scenario where it might be possible that Facebook would still include her in this target. Here it is: Maybe Cassandra last opened the Facebook app on her phone in NYC. She has enabled location services for the app in her smartphone privacy settings, but only when the app is open. She arrives to Miami, but doesn’t open Facebook on her phone. Instead, she arrives to her hotel, and opens Facebook on her laptop. 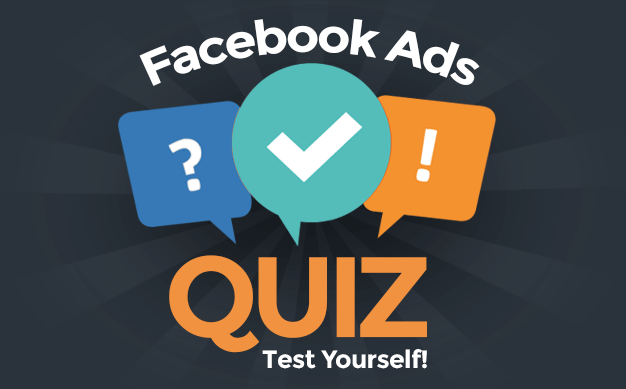 In this situation, at least theoretically, ads that are targeting People Recently in New York City may appear on her desktop, as the documentation that we’ve seen in the past indicated that Facebook relies on mobile device location only for the Recently In target. Since Facebook would not have her current location, it would assume she was most recently in NYC. However, these types of scenarios are likely not the norm. Let’s cover how your campaigns might be impacted by the various location target functionalities. There are potential implications on how people might presume this target functionality works. Based on the way I’ve seen and heard Facebook advertisers discuss the “Recently In” target feature, it seems they are sometimes using the option almost as a physical re-targeting capability. As an example, you might have an event in Atlanta, and you want to later re-target everyone who was recently in Atlanta – hoping to capture those who attended the event. Since Facebook would be constantly updating people’s “Recently In” location based on the most-current mobile device data, our ad would mostly be reaching people who are currently in Atlanta. That’s different than what we may have thought. This means the “Recently In” location target actually should NOT be used for physical location re-targeting, such as after an event held in an area. This may pose the question: Why does Facebook’s “Recently In” target even exist? For an answer, we can review the first breakdown of definitions at the beginning of this article (in The “Recently In” Target Feature section). As we saw there, the default “Everyone in this Location” target is going to include both people who live in that location and people whose most recent location was in the area. Since this includes people who live there (but who may be traveling), that could mean we actually have people seeing our ad who are not even in the location we specified. This thinking aligns with a scenario that Facebook mentioned where the “Recently In” target may be applied. As they state: “You might want to advertise time-sensitive sales, for example, to people recently in the location you choose”. Knowing that using “Recently In” is the closest alignment we have for people currently in a location, this makes sense. This can still be confusing for Facebook advertisers. To simplify, let’s break down campaign planning into two categories for your campaigns that use the “Recently In” location target. Category 1) Ads appearing on the mobile app. In this scenario, you should mostly just expect to reach people who are currently in that location you list. If they are on their mobile app, Facebook will continuously update their location based on the latest data. The latest data should reflect their current location. Category 2) Ads appearing on desktop. You should expect to reach people based on the location where they last were while using their mobile device, when Facebook had access to their mobile device location info. Given the different ways that mobile app usage can impact the way ads are targeted, it may be cleanest to focus only on using mobile app placements for any campaigns that using the “Recently In” target. Experiment, see what you find out, and feel free to share with us in the comments below. That was a fun ride down the targeting rabbit hole! “Recently In” can most easily be interpreted as Currently In a location, based on mobile device data. The “Recently In” option should not be considered an effective way to physically re-target people based on a location they visited in the past. Different location targeting options use different data to determine location information. Facebook’s Blueprint training module about Location Targeting appears to potentially have a mistake, or is outdated. A quick shout out to Trey Edwards over at getnerdywithme.com. After we published our own Detailed Guide on Location Targeting, he put together a super-interesting walkthrough on using exclusion targeting to get a much narrower location radius for a specific target – even down to a single building! How do you use Location targeting? What creative methods do you have?